Options Mocha, 12.5" x 25" x 0.5"
The surface of the bed will remain 12 to15 degrees above ambient air temperature and warms to your pet's normal body temperature when in use. 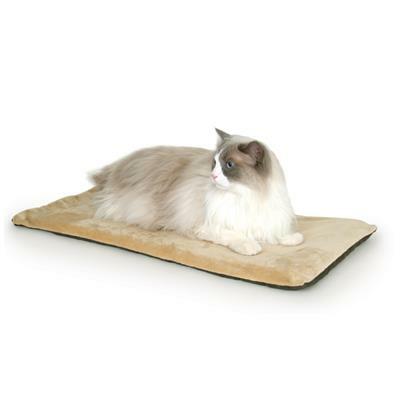 The Thermo-Kitty Mat is available in two colors and the cover is removable for washing. Indoor use only. All K&H heated beds and pads feature dual thermostats and are designed to warm to your pet's normal body temperature when he/she lies on the pad. When your pet is not on the pad, the heat will dissipate into the air and the surface temperature will vary according to the ambient air temperature.